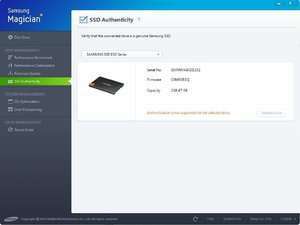 Samsung Magician is a tool designed especially for use with Samsung solid state drives (SSDs). It provides a number of useful tools for diagnosing, optimizing and benchmarking installed SSDs. The overall program can be a very useful tool for managing your Samsung hard drives while featuring a very well done user interface providing quick access to essential tools for optimizing your hardware. After installing Samsung Magician and running the application, you can easily benchmark, optimize and wipe data without much trouble. Version 5.3.1.2010 is a freeware program which does not have restrictions and it's free so it doesn't cost anything. For security reasons, you should also check out the Samsung Magician download at LO4D.com which includes virus and malware tests. Additional screenshots of this application download may be available, too.